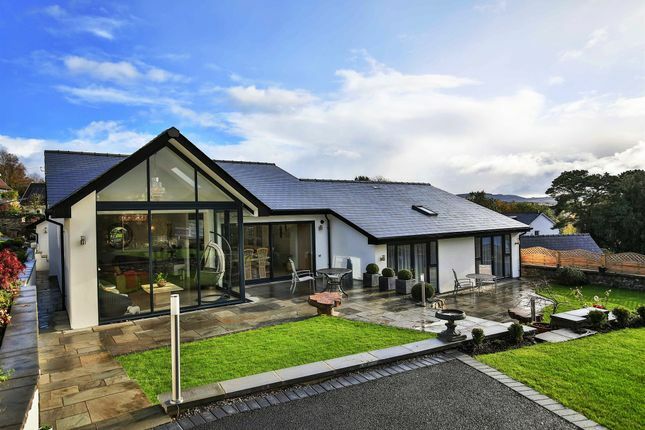 Extensively refurbished detached bungalow with outstanding views. 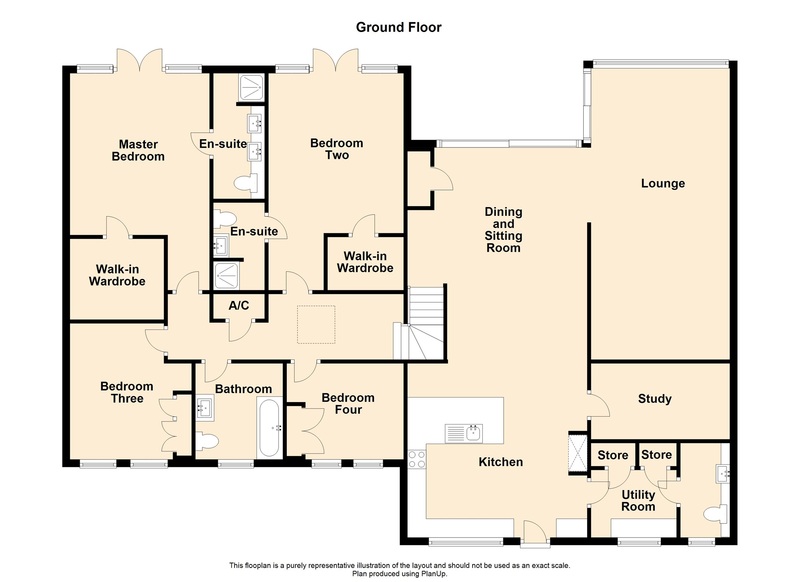 4 Double bedrooms - 2 with en-suites and walk-in wardrobes. Very spacious open plan living and dining areas. Kitchen with built-in appliances and utility room. Just minutes from the Breacon Beacons. Situated just minutes from the Breacon Beacons National Park, this 4 double bedroom/3 bathroom detached bungalow has been extensively reworked and refurbished by the present owners to provide a stunning home which enjoys amazing views towards the far hills and countryside. Situated just minutes from the Breacon Beacons National Park, this four double bedroom detached bungalow has been extensively reworked and refurbished by the present owners to provide a stunning home which enjoys amazing views towards the far hills and countryside. The owners have spared no expense on the property and the landscaped grounds, in order to ensure the bungalow is light and airy as well as being a very comfortable home with spacious accommodation. The bungalow briefly comprises a large lounge, with a feature apex window at one end to take in the countryside views, opening to a dining area and sitting room which also has full length windows to the garden. The kitchen, which is open plan as well, has been fitted with an extensive range of units and appliances. Adjacent to the kitchen is a study/office and a utility room which gives access to a cloakroom/wc. From the inner hallway there are four double bedrooms and a family bathroom. The master bedroom and bedroom two both have large walk-in wardrobes and en-suite shower rooms. Features include under-floor heating throughout, double glazing and a security alarm system. The landscaped gardens are generous in size and enjoy a south westerly aspect and multi-level sun terraces for outside entertaining. The property has a detached garage and off road parking is available on both sides of the bungalow with access from Somerset Lane and Cloth Hill Lane. The bungalow is in an enviable location in an elevated position to the north of the town, just minutes from the Brecon Beacons National Park and approximately 10 minutes by car from Pen y Fan with it's popular mountain walks and scenery. The Taff Trail is very close by and from here you can cycle or walk all the way down to Cardiff and the bay. Other facilities close to the bungalow include a golf club and other parkland areas. Access to Cardiff and the M4 is via the A470 which is a few minutes' drive away, and Abergavenny and the Midlands can be reached via the upgraded A465 Heads of the Valley road. Merthyr itself now enjoys diverse shopping with an out of town shopping centre to compliment the town centre shops and supermarkets. An impressive reception room with a vaulted ceiling at one end enjoying floor to ceiling double glazed windows which flood the room with natural light, and take advantage of the far reaching views across the garden towards the distant hills and countryside. The large windows also incorporate a sliding patio door to the sun terrace which is a superb area for entertaining and al-fresco dining. The lounge, which is open to the dining area, is very spacious and can easily accommodate a number of sofas and arm chairs. The polished limestone tiled floor has under-floor heating and there are fitted wall lights. The vaulted ceiling also has a Velux skylight window. Open plan to the lounge and the kitchen, this area also has a full length double glazed window and a sliding patio door overlooking the garden and taking advantage of the lovely views. Continuing from the lounge, the dining area has polished limestone tiled flooring with under-floor heating. Built-in cupboard housing the Worcester central heating boiler. Inset LED lighting and fitted wall lights. A short staircase with a glass tiled wall leads to the inner hall. A very useful office/study with a matching range of storage cupboards, a drawer unit and fitted desk. Inset to the ceiling are LED lights and a sun light tube. Polished limestone tiled floor with under-floor heating. Fitted with an extensive range of wall and base units incorporating Maia work surfaces and breakfast bar, with an inset stainless steel sink and mixer tap. Inset downlights to the wall units. Built-in aeg oven and microwave as well as a four ring induction hob with a stainless steel and glass canopy style extractor over. Built-in dishwasher and wine cooler. Space for an American style fridge. Concealed LED down-lighting to the 'kick boards', illuminating the polished limestone tiled floor with under-floor heating. Double glazed window and door to the driveway. The contemporary white suite comprises a wash hand basin and a wc with a concealed cistern. Polished limestone tiled floor with under-floor heating. The inner hallway, which enjoys plenty of natural light from the large Velux skylight window, leads to all the bedrooms and the family bathroom. Inset LED lighting. Polished limestone tiled floor with under-floor heating. Built-in airing cupboard. The tiled en-suite has a vanity unit along one wall incorporating twin sinks and a wc with a concealed cistern. Above the sinks is recessed shelving with a sliding mirror and inset down-lighting. Walk-in shower area with a thermostatic rainfall shower. Heated chrome towel rail. High level Velux skylight window and inset LED lighting to the ceiling. The white suite comprises a close coupled wc and a wash hand basin set on a vanity unit with a mirror and lighting over. Walk-in shower area with a thermostatic rainfall shower. Ventilation extractor. Inset LED lighting and sun tube. Ceramic tiled walls and polished limestone tiled floor with under-floor heating. The third double bedroom is fitted with a range of wardrobes on one wall. Carpet flooring with under-floor heating. Two, tall double glazed windows. A double bedroom fitted with a range of fitted wardrobes to one wall. Carpet flooring with under-floor heating. Two, tall double glazed windows. A modern white suite comprises a shaped shower bath with a shower screen and a thermostatic rainfall shower, a wash hand basin set into a vanity unit, and a close coupled wc. Tiled walls and floor with under-floor heating. Inset LED lighting. Double glazed window. Approached from Somerset Lane via a tarmac driveway which leads to the parking area for several vehicles as well as the detached garage. From the driveway there is paved access to the rear garden either side of the bungalow. Behind the garage, steps lead up to a 'kitchen garden' and an 'astro-turf' lawn with well stocked plant and shrub borders. The main garden enjoys a south westerly aspect and outstanding views of the surrounding hills and countryside. Paved sun terraces, which are on different levels, lead to level lawns with well stocked borders and a raised stone flower bed. Within the garden are other seating and deck areas to take advantage of the views and sun. Walled and fenced boundaries. Outside lighting. An electric sliding gate from Cloth Hill Lane at the rear gives access to an additional off road parking area. A detached garage with a remote controlled roller shutter door and a pedestrian access door to the side. Power and light.